Older houses are interesting to create and have a part to play in both showing how they were decorated and furnished and pointing the way to the future. 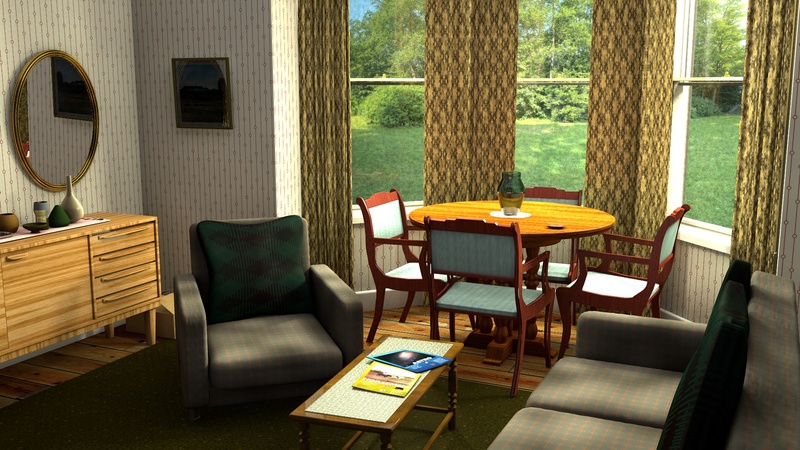 This project is an older house, possibly Edwardian, which is depicted here furnished and decorated as it might have been mid-century. 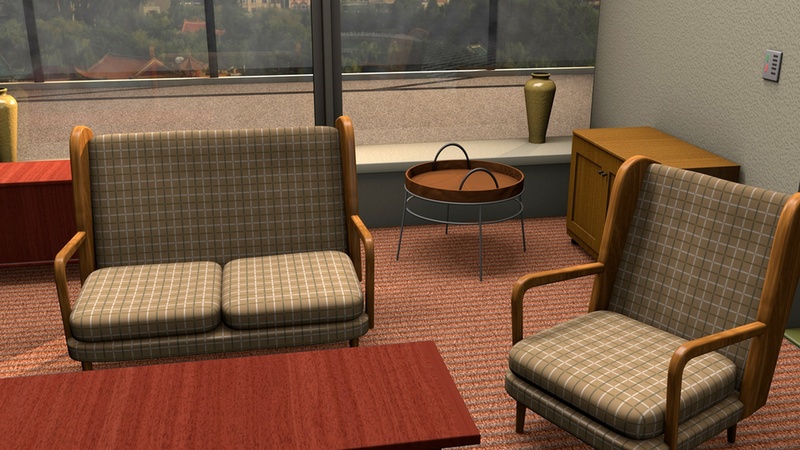 The project was created in Cinema 4D and that program was used for the render. I have, in fact, exported the shell of the house to Daz Studio and, hopefully, there will be another picture shortly. This house is restrained mid-century with a comfortable sofa; a nice light wood sideboard, and a dining table in the bay window which overlooks the large garden. A feature of the 1950s and then the 1960s was the fitted carpet. Until then, carpets were simply rectangles that were bought at a particular size and put in place in the room, as is the case here. It was not expected that the carpet would fit and around the outside there will always be a border of floorboards, as is depicted here. Fitted carpets, when they arrived, revolutionised the look of interior spaces and in particular fitted carpets made the best use of the new style housing which had squarer rooms with less adjoining spaces. It is the fitted carpet that is partly responsible for the solid ‘walls of colour’ look of rooms. 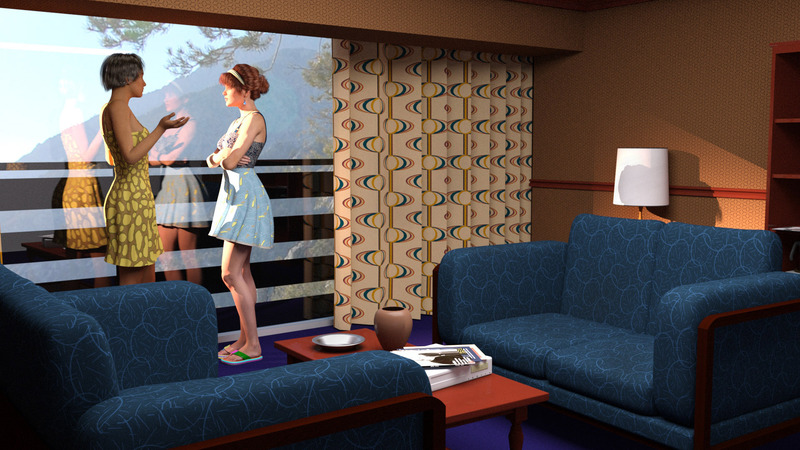 This house probably belongs to an older person because it contains a mixture of older and newer styles and in the version I am preparing for Daz Studio I am showing the room as it might have looked used by the householder’s children. For access to a full size image, my Flickr page is here. Every house should have a clock and this clock was the one to have in the 1960s and, I believe, it still could well be today. The 1960s, both in the UK and elsewhere, was a time of great design and innovation and in this period many designs were created which have been developed and are still available today. Clocks were particularly suitable for design since they do not have a shape which is predetermined, other than to have some form of dial and hands, and many weird and wonderful designs were invented. For this clock, however, I have used the ideas from various designs created during this period and produced a sort of composite incorporating many of the features that I particularly like. If it were real, then the materials used for the clock would be metal and wood, materials which were much in evidence as the 1960s wore on into the following decade and which are popular today. 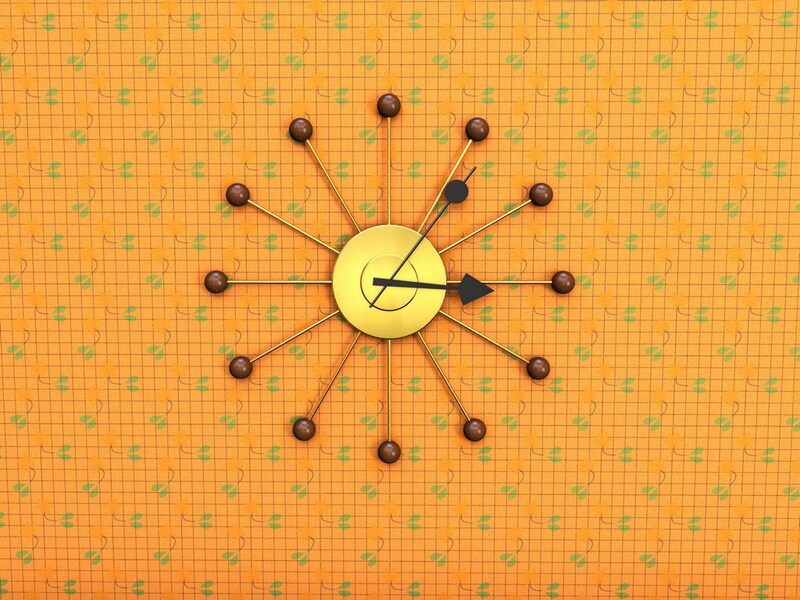 In order to showcase the clock I have shown it against a wallpaper which could well have been in use at the time although perhaps not in the colour shown. However this colour does help to show up the features of the design. At present a slightly older Edwardian house is being developed at 20th Century 3D although I hope to return to more 1960s and 1970s style homes and furniture in the near future. For access to a full size image my Flickr page is here. Yes, I know it’s taken some time, but I have been involved with other 3D work which has taken more time than I thought. However, at last, my first Daz Iray render is finished. Once that was complete I used a HDRI file that I obtained free from the Internet as a background, getting the Iray render to draw the dome. One problem I encountered is that it does not appear possible to easily see what portion of the image will appear through the window and so some frustrating trial and error took place before I was able to find a suitable part of the picture. I then took two Genesis 2 models from Daz and put them in conversation before saving them in Daz format. It was easy then to merge this file and then position the girls in front of the window in a natural pose. The lighting is simple emission lighting for the room, the HDRI for outside and a spotlight, suitably positioned, for the sun. Overall I suppose I must have spent a week playing with various renders, lighting and texturing setups before I settled on this final image and now I have to say that I am pleased with the result. In an ideal world I would have added some dirt to both the room and the furnishings rather than resort to Photoshop. Is this the way to use representations of people in 3D work? I believe that it is, I think the standard of finish for Iray is very acceptable and using Daz Studio means that it is not necessary to fiddle with the facial textures of the models in order to make them look good. Will I try this again? Certainly, I have learned a lot and gained some valuable experience in both exporting models to Daz Studio and in producing an acceptable scene. Looking back, it was both frustrating and exciting but it is definitely a project that I will look at again in the near future. As I explained previously, I wanted to create a new fabric for the chairs that I’m going to use in Daz Studio and one which looked a little more colourful. After a lot of thought and looking through the various patterns that I have already created over the years I decided to use a check pattern. This one is quite bold yet the colours harmonise well with the wooden furniture and would look good with most other colour variations in either this room or the other apartment which I have already posted. 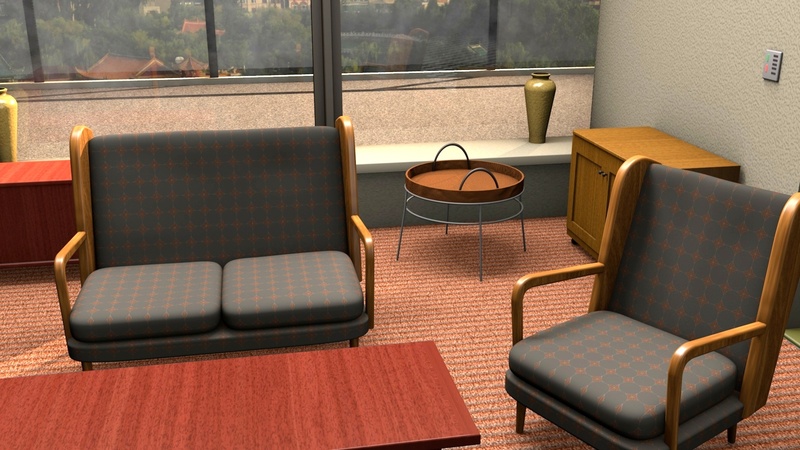 In fact, while preparing this render, I wondered whether it might be better to use this particular set in Daz Studio along with this sofa and chair. 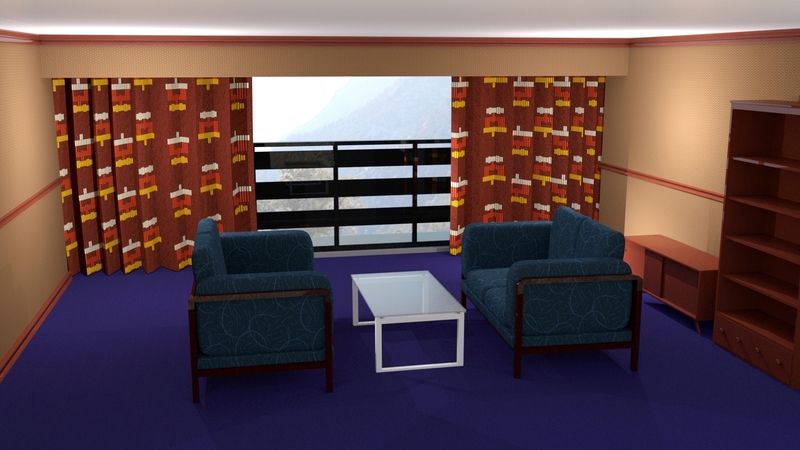 I just need to do some finishing work on the cushions and the chair structure while the other furnishings in the room are probably satisfactory as they stand. Coming back to the fabric, as I said previously, furnishing fabrics should be pleasant yet not take centre stage. Check patterns are very good for this since they can contain a variety of colours and yet they do not catch the eye. 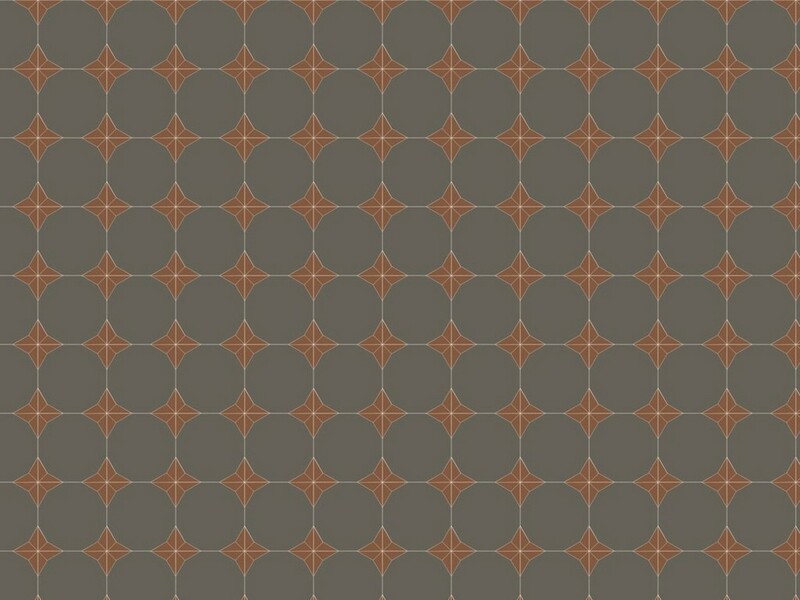 To make this more of a picture I have used a wide-screen render and I have to be honest and say that I am quite pleased with both the pattern and the picture that has been produced. This set was designed as a penthouse suite and I like the textures and dimensions so I will attempt to make this work in Daz Studio. That will then give me to sets two use for creating slightly more artistic pictures than simply architectural visualisations. You can see the pic at full size on my Flickr page here. They say a good furnishing fabric should enhance and beautify the furniture on which it is placed without, however, looking too obvious. This fabric is destined, eventually, for the sofa and chairs created in the apartment which I have now ported to Daz Studio. Initially, however, it is important to get the colour and the look of the fabric right and so this is a test render in Cinema 4D. The room is a penthouse apartment that could be in any city although the original was in Asia. The fabric is shown used on the sofa and chair where it can catch the natural light which enters the apartment from the windows. This particular sofa design also uses a large area of wood so the fabric can be seen against the look of the natural wood. it is, perhaps, that afternoon and there is just a little sunlight entering the room as well. Interestingly, designing furniture fabric is not as easy as it might appear but I am pleased that this fabric looks neutral and natural and yet enhances both the shape and appearance of the furniture. As you can see this is quite a close-up render and to make it more of a picture I have used a wide screen HD format. My overall impression is quite good but I might experiment this week to see if I can create something that is a little more colourful as well. For those who like such things, the design for the fabric was created in Adobe Illustrator and the render is in Cinema 4D using just the basic renderer. All the models and textures for this set were made by me in Cinema 4D while most of the supporting textures were created in Filter Forge. As always, there is a larger version of this image is on my Flickr page which is here. I have difficulty transferring figures from Daz Studio into Cinema 4D and, now that Daz has the excellent Iray renderer, it seems easier and maybe better to transfer the scenery into Daz! The image above is a sort of first effort. I have transferred over the layout of the room and a couple of bits of furniture. First impression is that I am pleased with the result. The walls look good, they have a nice, even matt colour from the texture and so do the curtains. The carpet – well – it’s not so bad but needs tweaking as does the wood on the units. The wood texture is made with Filter Forge and usually creates a nice rich texture so we have work to do there. The balcony looks nice and the view behind is sort of OK, it needs a bit more contrast which I am sure I can do. The view is a hdr image of the Sierra Madre mountains and I think this will provide a ‘holiday home’ type feeling which I like. The texture – before you tell me – on the chairs is there to see how it looks, of course it will be on a smaller scale in the finished piece. Again, I am pleased with the result and not so pleased with the wood detail on the chairs but this can be fixed. The disappointment (there’s always one isn’t there!) is the table. This is brushed aluminium (chrome might have been better) legs and a glass top. OK, so it needs some better shaders but I am sure that be arranged. I don’t normally post WIP but I thought this be useful and it gives me something to look at and a base from which to work.